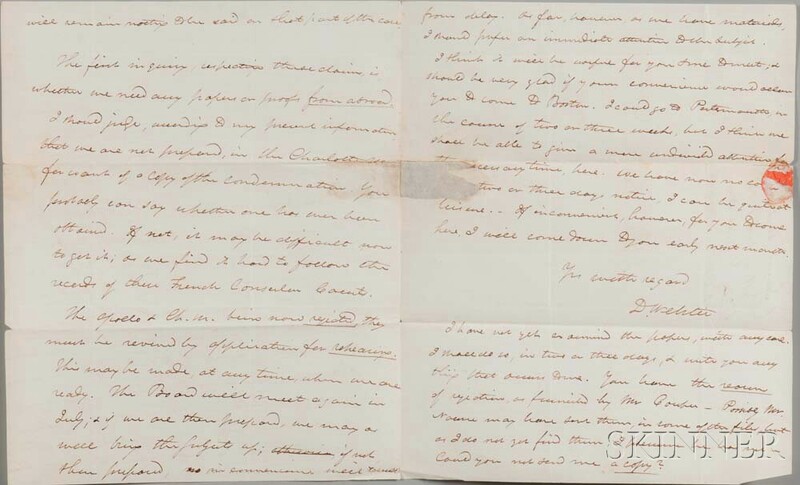 Webster, Daniel (1782-1852) Autograph Letter Signed, 24 April 1823; [and] Autograph Note Signed, 5 October 1846. Webster, Daniel (1782-1852) Autograph Letter Signed, 24 April 1823; [and] Autograph Note Signed, 5 October 1846. The letter on a large wove paper quarto bifolium, inscribed over three pages, with a postmarked self-envelope. To James Sheafe Esquire of Portsmouth, New Hampshire, regarding the case of the ship Apollo and the brigs Charlotte Murdock and Juno, taken by the French. Old folds, hole created when the letter was opened repaired, 9 3/4 x 8 in.